Are you into social media? Let’s connect! Regular readers may already know this, but if you’re new to this site or whatnot, you can find me on numerous social media outlets. I stay pretty active on a number of Twitter chats (#ATQA, #trailtime and #hikerchat are my go-to favorites) if you’re a Twitterati kind of person. Look me up @RMHigh7088 (yes, an old school Twitter handle that isn’t very cool. But there it is). On Instagram, find me @Proactiveoutside. I post a lot of pics about some of the amazing places I see from far away or close to home. And check out some of my shots at #seenontherun, #seenonthetrail or #urbantrail. If you’ve got some cool shots of your own, tag ’em with these. I’d love to see them! On Facebook, check me out at Proactiveoutside. I post links from this blog there, but also a lot of other interesting links and photos related to the outdoors, fitness, running, conservation and adventure. Click on the “Like” or “Follow” buttons seen on the right side of this page, or just find me on the web. See you all on the Interwebz! It was bound to happen, sooner rather than later. A collision of forces, innocuous by themselves, but in combination pretty unfortunate. An affinity for the outdoors, social media and a desire to be noticed by a lot of people have brought us… creepytings. Casey Nocket and her creepytings vandalism. 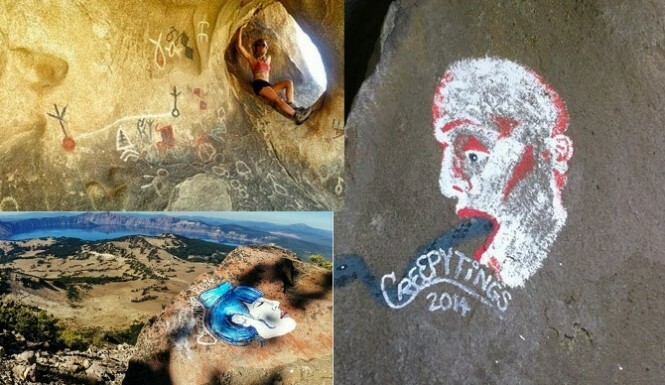 Creepytings is an Instagram gallery of photos that a woman named Casey Nocket created in which she photographs acryllic paintings she plasters on rock faces in the country’s national parks. I’m sure some people found these stunts interesting or cool, but most public reaction has been harshly negative. And for good reason, as it’s not only defacing places that are set aside to remain pristine, but it’s also illegal. The “art” in itself looks like graffiti intended to look like primitive cave paintings. At least that’s the impression I got. Photographs showcase the paintings, and sometimes heavily stylized images of her with her paintings. It’s very hipster-in-the-wild chic, I guess. I’m not going to debate whether or not what Nocket did was wrong. It’s obvious it was. Whatever punishment she has coming can’t come soon enough. And it would be easy to take shots at the younger generation that has embraced all things social media and photography. No hike goes undocumented, no selfie is one too many. 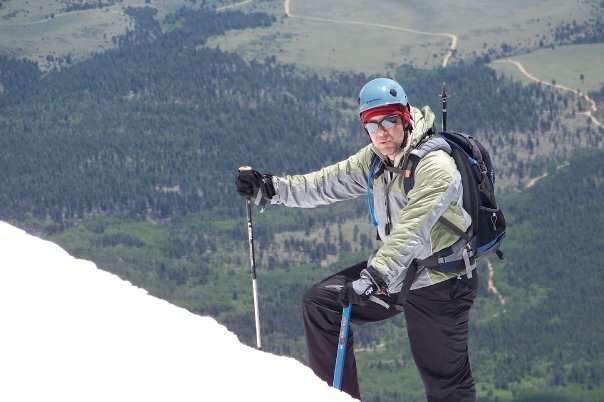 Go Pros and “Go Poles” have changed the way we see the outdoors, and how we portray ourselves in it, or more accurately, the image we try to portray of ourselves. Whether it’s a thing of personal branding or just hunting for likes, the result is the same — there is a lot of media out there of people doing things outside. I’ll admit to being at least partially guilty of that. 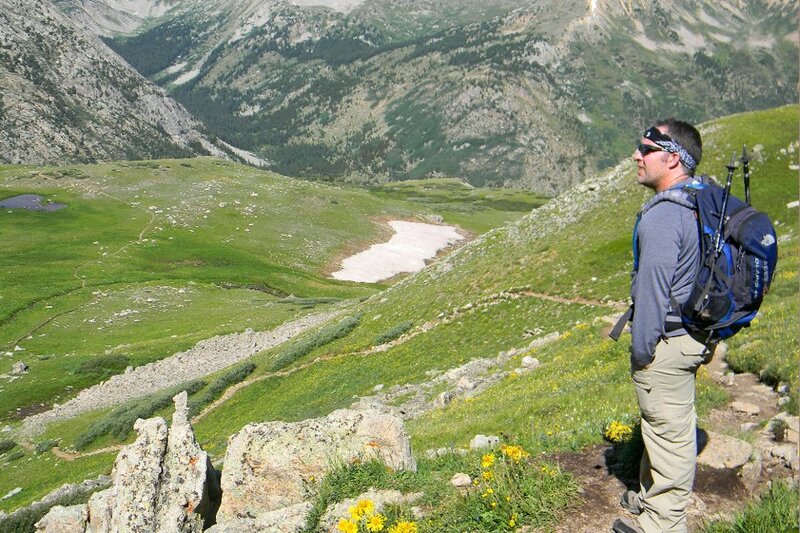 The biggest reason I write in this space is to showcase the outdoors and the need for all of us to be out in it. When you’re in it, you learn to respect it. That’s my theory. But on that note, we’ve got work to do. I’m a huge proponent of my local urban wild space, Turkey Mountain Urban Wilderness. It’s an awesome place where I can run trails and hike, and it’s within Tulsa’s city limits, 15 minutes from my front door. But I get discouraged when I see stuff like this. 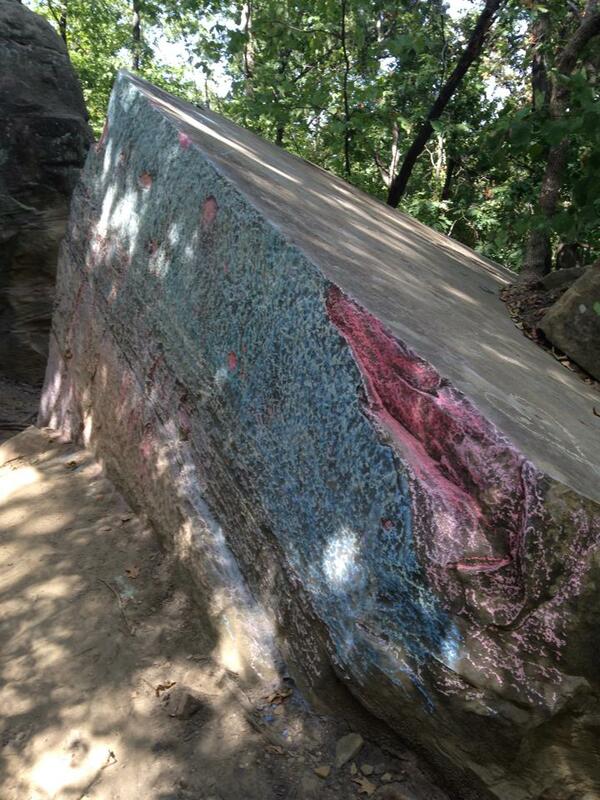 Someone’s bad idea of “art” at Turkey Mountain Urban Wilderness. That was all chalk, but there are other rock faces defaced with spray paint. Similar acts of vandalism have tagged a number of wilderness areas I’ve visited. This is not a new problem, though one that’s worth fighting. What’s different is people (in this case, Nocket) making it so public, justifying it as “art,” and then publicizing it widely (before she succumbed to public backlash and made her Instagram account private). So I see this in two ways. We’ve succeeded in getting people outdoors, at least to a certain extent. But we’ve failed in terms of instilling the sense of responsibility people need to have in caring for wild places. The chalk art, the creepytings paintings, the video of two idiots hitting golf balls off a mountain summit — all cases of people doing decidedly non-awesome things outside. Or maybe we haven’t totally failed. Perhaps that’s too harsh. But if Casey Nocket teaches us anything, it’s that we have a lot of work to do in terms of teaching people to respect and protect wilderness. So let’s get this message out. If you don’t respect it, you won’t protect it. And if you don’t protect it, you won’t have it for much longer.